Swearing, Rants, Reviews, On Every Level! I said this last week to but I always struggle to find something relatable to review for TBT when my Tuesday post is about a book. Without any real ideas of my own I madly searched Netflix for any film with “love” in the title. The one that jumped out at me the most was the Woody Allen film from 5 years ago. I wanted to see it when it came out but I don’t think I have any friends who still have hope that Allen can produce a film worth paying to see. I understand where they’re coming from. The last few years really haven’t shown the great director at his best. I’ve also struggled to keep my faith alive over the years. It’s only thanks to his random successes (Vicky Christina Barcelona and Midnight in Paris) that keeps me coming back. For every film I love there’s at least 2 duds. Still, I like to think that one of my strongest attributes is unflinching and, potentially, misguided loyalty so I’ll always keep getting drawn back in. I’ve waited to see To Rome With Love for years so I started off being really excited as the film started. I was experiencing the same feelings that I always feel with Woody Allen films: that is the familiar nostalgic warm feelings that mainly come from remembering his golden age. You know, the films that just seemed to get everything right. This film is a collection of four separate stories that all take place in Italy’s capital city. There is the story of an American tourist (Alison Pill) and her Italian fiance (Flavio Parenti) and the trouble that arises when their families meet. Then we have a newly married couple (Alessandro Tiberi and Alessandra Mastronardi) who get themselves into all kinds of farcical scrapes. There’s the famous architect (Alec Baldwin) who is revisting the Rome of his past and meeting a young couple (Jesse Eisenberg and Greta Gerwig) and their friend (Ellen Page) who threatens to come between them. Finally, there is the story of a regular office worker (Roberto Benigni) who becomes an overnight celebrity for no reason and who struggles to deal with the consequences. Of these four narratives it is the latter that is the least successful. The premise, based around people who become famous for being famous, is an interesting one but Allen doesn’t seem to know where to take it. The plot just meanders around in a forgettable and unexciting way. You can’t help but feel that this could have been missed to give more time and attention to the other narratives. All of which have some great aspects to but, also, give you the idea that they weren’t developed enough. The best, by far, is the story of Alec Baldwin’s architect, John, and his chance meeting with a young architect student, Jack (Eisenberg). Jack lives in Rome with his girlfriend, Sally (Gerwig), but finds himself drawn to her friend, Monica (Page). Monica is a pretentious wannabe who knows just enough to fake a depth that she doesn’t have but it is enough to cause Jack to start imaging their life together. As his connection with Monica strengthens John becomes the voice in his ear that warns him of the dangers. The problem with this story is that I so wish it could have been longer because it feels like there was lots of potential there. Is Jack real or is he simply a distant memory that John is conjuring up as he re-familiarises himself with Rome? The final two stories both have their charms but I really found myself caring less and less as they went on. The story of the newly married couple is something that kind of outstays its welcome and only survives thanks to Penelope Cruz’s turn as a prostitute who accidentally gets caught up in a family drama. It is this narrative that I found most annoying because it falls too far away from reality and well into the realm of sitcom farce. The couple are continually kept apart by a series of ridiculous events that just gets more absurd as time goes on. It’s the kind of thing that wouldn’t happen in real life because people would have the sense to admit the truth to everyone. The actors who play the husband and wife are both very charming but I could have done with less of this. The final vignette is a bit of a mixed bag. 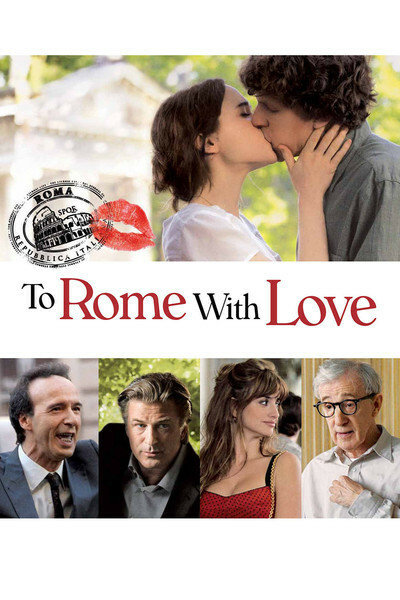 It features Allen himself who is visiting Rome to meet the parents of his daughter’s fiance. Having recently retired and never feeling accepted during his role as an Opera director, he is overcome when he hears his future son-in-law’s father sing in the shower. He quickly gets carried away and, before anyone can stop him, soon has the poor man in front of a crowd. Unfortunately, he is only comfortable enough to perform whilst in the shower so Allen’s character must make some creative staging decisions. There is a lot of good material within this narrative but, again, it feels as though it could have been pushed a bit more. As it is, it is difficult to accept this reality and it feels a bit too farcical. I wanted to love this film, as I do with every Woody Allen release of recent years, but it feels as though he came up with 4 half ideas and shoved them together. There isn’t a fully developed idea in the bunch and pushes the magical realist genre further into the realms of farce. Even the dialogue, something we’ve come to expect will be perfect in any Woody Allen film, feels off in places, There is something awkward about the conversations and things don’t flow as they should. Of course, alongside those moments there are some fabulously Allen scenes where the acting, script and imagery just work. It’s just a shame they couldn’t happen more frequently.